The 2013 Ford Fusion will offer the broadest range of drive train and sustainability choices in Ford's Power of Choice concept of enabling the customer to choose the drive train that suits their needs. Ford Motors' strategy, The Power of Choice, is about giving the customers a broad ranging choice of drive trains, each with its own fuel efficiency and environmental friendliness characteristics. It also gives Ford the flexibility to adjust the product mix to meet market demand. The concept is to design the vehicles and manufacturing processes to build gasoline, or hybrid, or electric versions of the same car on the same assembly line, just by installing different drive train components. The first full implementation of the Power of Choice is the 2013 Ford Fusion, an all new design for the Fusion, which will come in gasoline (EcoBoost), hybrid and plug-in hybrid models. It will offer best-in-class fuel efficiencies in all three versions, and will be built using biomaterials, recycled and recyclable materials for an even stronger sustainability story. The Power of Choice concept is about giving customers the freedom to choose a new aspect of car design. There have always been a myriad of choices in buying a car or truck, from colors to accessories, and all the 3rd party addons at the auto parts stores. One thing the customers have not been free to choose is the power system driving the car. While there is often the choice between big engine or small engine, the engines always burned a fossil fuel, either gasoline or diesel, and there was essentially no freedom to choose anything other than one of those two fuels. In the Power of Choice concept, every car in Fords lineup would (in theory) be available with either traditional gasoline, or EcoBoost, or Hybrid, or Plug-in Hybrid, or Electric, or Fuel Cell drive train. When ordering the car you simply check the box for the desired drive train, and at the factory the car is assembled to your desire. In practice, Ford is in the early stages of implementing this concept. For example in the 2012 model year the Ford Focus is available in either gasoline powered or electric versions, with the Ford Focus Electric being built on an identical chassis to the regular Focus. Likewise the 2012 Fusion is available in either gasoline or Hybrid models, and the F-150 can be configured with the EcoBoost engine. In the 2013 model year this concept is broadening, to include the F-150, C-MAX, Fusion and Focus, with the Fusion having the broadest range of choices. Each 2013 Ford Fusion model will have best-in-class fuel efficiency, which is part of Ford's strategies to get ahead of the government regulations and start leading in fuel efficiency and emissions footprint. The gasoline powered Fusion will come in both EcoBoost and non-EcoBoost models, with the 1.6-liter EcoBoost expected to deliver best-in-class four-cylinder non-hybrid fuel efficiency of 26 mpg in the city and 37 mpg on the highway. The 2013 Fusion Hybrid will switch to using lithium-ion batteries to save weight and give more power, while boosting the maximum speed under electric-only power from 47 mph to 62 mph. It will use an all-new 2.0-liter Atkinson-cycle four-cylinder gasoline engine, while smaller than the 2.5 liter engine used before, will still maintain power levels. As a result it will deliver best-in-class fuel economy of 47 mpg in city driving and 44 mpg on the highway. This outperforms the fuel efficiency of both the 2012 Toyota Camry Hybrid and 2011 Hyundai Sonata Hybrid. 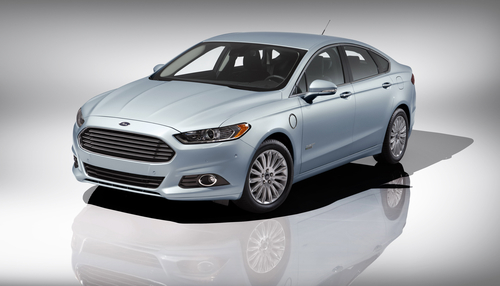 The 2013 Fusion Energi (plug-in hybrid) aims to be the most fuel efficient mid-size sedan in the world. Ford has not yet released specifications of this car, but the company expects fuel efficiency over 100 MPGe, which will be significantly more efficient than the 2012 Chevy Volt or 2012 Toyota Prius Plug-in, and more efficient than most of the electric cars as well. The 2013 Fusion will additionally include some advanced safety features, some of which are only available on ultra-high-end cars. Lane Keeping System: Several cameras and sensors will track the cars position within the lane, and give a variety of warnings to the driver meant to keep the car within its lane. Adaptive cruise control: A forward-looking radar looks down the road to gauge the traffic ahead and, when activated, automatically speeds up and slows down the car to match the traffic. Active park assist: On-board sensors allow the car to identify suitable parallel parking spaces, calculate trajectory and steering to park, and perform the parking maneuver, requiring the driver only to operate accelerator and brake pedals. Blind Spot Information System (BLIS) with cross-traffic alert: Sensors in both rear quarter panels detect traffic within blind spot areas, and providing warnings about such traffic. It can also warn the driver while backing out of a parking space whether there is oncoming traffic. Ford's exploration of sustainable transportation does not stop at the drive train. The company is also researching a range of "sustainable" materials to use in other parts of the car. The 2013 Ford Fusion will contain a broad range of recycled and recyclable materials including: a) recycled denim material equivalent to two pairs of jeans; b) 38.9 clear plastic 16-ounce recycled bottles; c) about 31,250 soybeans. These materials are used in a variety of ways. The denim material is used as sound-absorbing material for noise, vibration and harshness (NVH) control. The clear plastic bottles are used in manufacturing the 100 percent REPREVE yarn, a hybrid of post-industrial and post-consumer waste, for the material in the cloth seats. The soybeans are used to create a foam used in seat cushions, seat backs and head restraints. Today, Ford uses soy foam on every vehicle built in North America. Using soy-based foams replaces the use of fossil fuels that go into manufacturing traditional foams. Rising oil prices are not only making consumers look for fuel efficient cars, it is part of the impetus driving Ford to explore alternative materials. Many traditional materials are manufactured using chemicals coming from fossil fuels. Ford is exploring the use of everything from shredded retired currency to cellulose from trees, Indian grass, sugar cane, dandelions, corn, coconuts and more, in an effort to reduce the use of materials derived from fossil fuels.